Learn about our Mission to serve all beekeepers with hives in Washington State. As a group, the WASBA is able to lobby for things such as the Section 18 permission to uses specific miticides, as well as fund research and development. 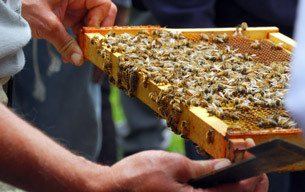 Activities throughout the year highlight current research, train new beekeepers, and assist experienced beekeepers in learning new techniques. WASBA is a volunteer driven organization. WASBA directors & officers and committee members contribute their time and energy to the organization. Visit the Membership page and join today.